In spite of the depression, bank failures, hard times and a disastrous flood, the city made great improvements and remarkable progress during the thirties. In fact, there have been few decades, if any, that faced such great difficulties, and few that produced greater achievements. 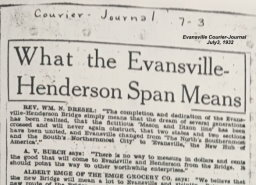 One of the great accomplishments was the building of the Evansville-Henderson bridge over the Ohio. Such a highway connection had been needed for many years. Many plans had been advanced for a bridge. Some of these were by private concerns that would have retained ownership and received tolls indefinitely into the future. When the Commonwealth of Kentucky notified Indiana in 1928 that the Kentucky highway department proposed to build this bridge, the Indiana highway department proposed that it be built as a joint enterprise. It was an unusual situation in that all of the bridge, even the northern approaches for more than a mile, were in the state of Kentucky. It was evident, however, that the benefits of the bridge would be as great, if not greater, for the people of Indiana. The proposal made by Kentucky was for the Indiana highway commission to pay one-half of the cost. Kentucky would pay the other one-half with revenue bonds which would be retired by collecting toils on the bridge. Indiana would not agree to this arrangement. In order to clarify the situation Kentucky brought suit in the United States Supreme Court in October, 1928, to compel Indiana to do her share in accordance with this plan. It was a friendly suit designed to clarify the rights and responsibilities of the two states. 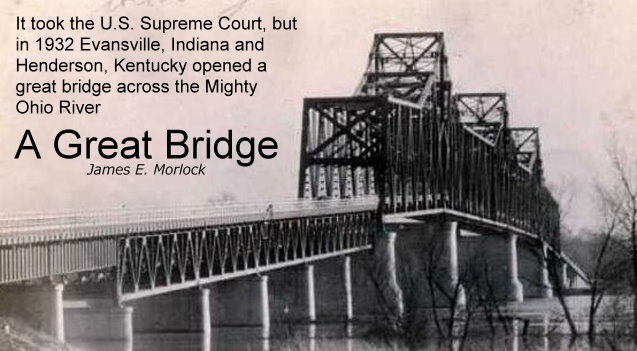 In May, 1930, the U. S. Supreme Court ordered Indiana to proceed and cooperate in building the bridge under the proposed plan. It was further provided, however, that the Federal government would grant to Indiana an equivalent sum from the Federal highway fund. Actually then the result was that the Federal government would pay one-half of the cost of the bridge and the motorists would pay the other half. Construction work began in the spring of 1931. For several months the work was limited to laying the foundations beneath the surface of the river. After the concrete piers were finished, the steel work was started. The steel trusses were fabricated in Pittsburgh and shipped down the river on barges. The cantilever method was employed to place the steel, piece by piece, keeping both sides of the structure in balance. The total length of the steel structure is slightly more than one mile The center span is 600 feet long and is high enough about the river so as not to interfere with navigation on the river at any time. The strength and stability of the structure is attested by the fact that it was not damaged to any serious extent by the great flood of 1937. The main river piers have a total height of 170 feet much of which is under the water. The steel towers rise 100 feet above the piers. These concrete piers are founded on bedrock beneath the bed of the river. They were constructed by the pneumatic caisson process, the concrete material being forced though the sand and gravel to bedrock under heavy air pressure. It was singularly fortunate that no one was killed or seriously injured in all the dangerous work involved with the bridge. The construction involved the use of 78,000 cubic yards of concrete, 40,000 lineal feet of pre-cast concrete piling, 7868 tons of reinforcement. The architectural engineers were Modjeski and masters of Pittsburgh. The total cost of the bridge was $2,500,000. The bridge was completed in the summer of 1932 and was dedicated on July 4, with Governor Harry G. Leslie and Governor Ruby Laffon of Kentucky participating in the program. Miss Lois Schear, six year old daughter of Mr. and Mrs. William Schear, cut the ribbon which officially opened the bridge. It was a great three-day celebration which was climaxed by a brilliant water pageant in front of Sunset Park, in the evening by a banquet and a mass meeting at the Coliseum. The new bridge became toll free March 20, 1941.